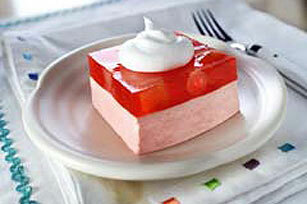 Strawberry gelatin made with orange juice and fruit cocktail is layered with creamy gelatin for a refreshing salad or dessert. Add boiling water to gelatin mix in large bowl; stir at least 2 min. until completely dissolved. Add enough ice to juice to measure 1-1/2 cups. Stir into gelatin. Refrigerate 30 min. or until slightly thickened. Remove 1-1/2 cups of the gelatin; place in medium bowl. Stir in fruit; set aside. Stir half the COOL WHIP into remaining gelatin with whisk until well blended. Pour into 8-inch square dish. Refrigerate 10 min. or until set but not firm. Carefully top with fruited gelatin. Check our Healthy Living version of this recipe Low-Fat Fruit 'n Juice Squares.